The HAE01 is an HDMI multifunction tool: allow you to extract 4K HDMI for both digital optical S/PDIF (Toslink) and stereo analog audio signal for use by an amplifier or AV receiver. Support HDMI 2.0, HDCP 2.2, 4K@60Hz 4:4:4 18Gbps(6Gbps per color)3D,HDR. 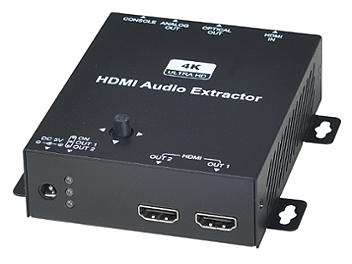 Extracts the 4K HDMI audio and output to a multi-channel digital or analog audio signal. Support HDCP 2.2 convert to HDCP 1.4. Support 4K 4:4:4 convert to 4:2:0.